UK Investment Clubs that have adopted the HM Revenue & Customs Standard Form of Agreement have to return Form 185(new) stating member gains, losses and income over the applicable tax year. Two copies of this form should be completed and signed by the secretary or other responsible officer of the club. One copy should be sent to the Inspector of Taxes at the club's local HMRC tax office and the second copy should be given to the club member. Form 185(new) should be submitted by the 6th of June each year. Investment Clubs can use TimeToTrade to manage their club accounts, apportion income, gains and losses, then generate Form 185(new). 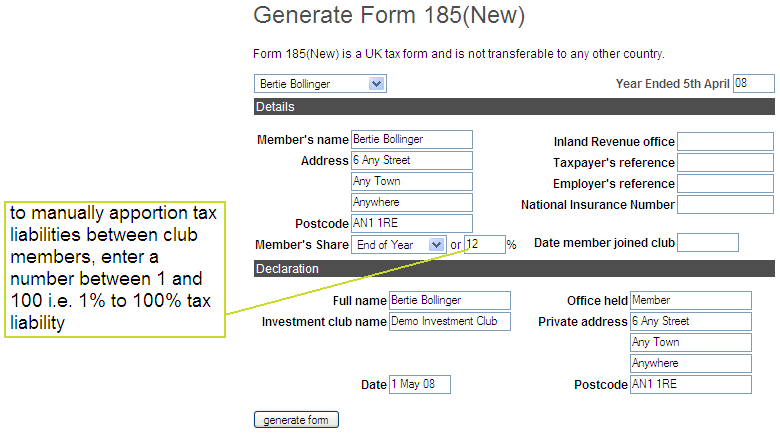 Form 185(New) details a member's apportioned share of the club's income, gains and losses. Two methods of apportioning income, gains and losses are supported by TimeToTrade, based on either the number of units held by each club member at the end of the tax year relative to the total units owned by club members, or the average units held by each club member over the course of the tax year. The Treasurer, or other officers of the Investment Club, are responsible for calculating the Income and Capital Gains Tax, including any indexation allowance which may be due, however Taper Relief will be a matter for each individual member. 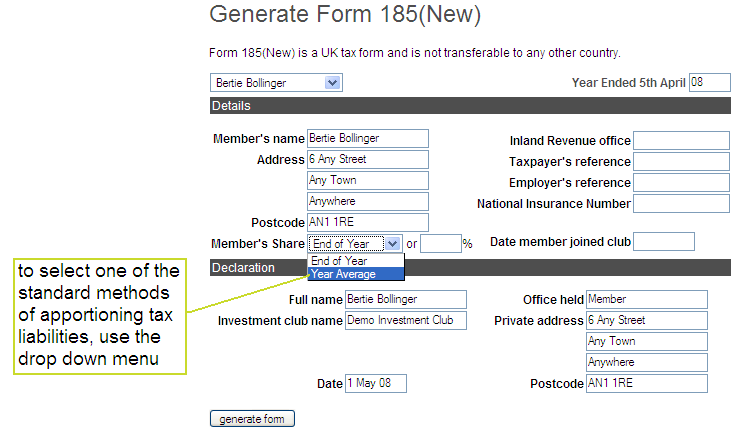 Using TimeToTrade the Treasurer, or other officer of the Investment club, can generate Form 185(new) which can be printed or emailed to club members as a pdf. TimeToTrade will automatically calculate the apportioned gains, losses and income tax for each member, including indexation, and print the information on Form 185(new). Individual club members are responsible for determining their Self Assessment Tax return liabilities, including business and non-business taper relief, apportioning loss, chargeable gain etc. Club members can view their apportioned Capital Gains and Income Tax liabilities using the TimeToTrade Tax Products, and use the information to complete their HMRC Self Assessment Tax returns. After you have selected the club member's name from the drop down menu, if you know your club member's address and tax details, you can manually enter them. If your club members have already populated their addresses in their personal user profile, address details will be automatically populated. 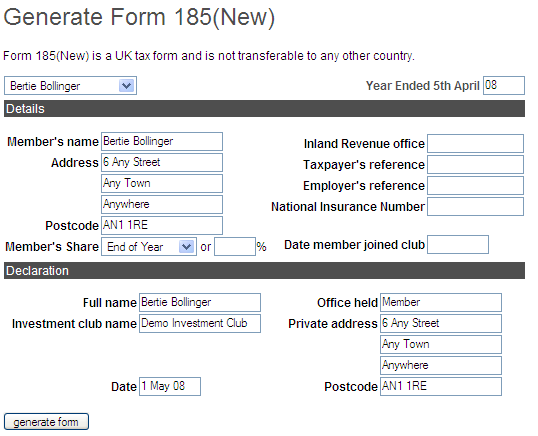 For security reasons TimeToTrade does not retain investment club members personal tax, employer and national insurance numbers; these can be either entered by typing the relevant information into the text boxes, or by asking the club members to manually complete Form 185(new) after it have been printed. 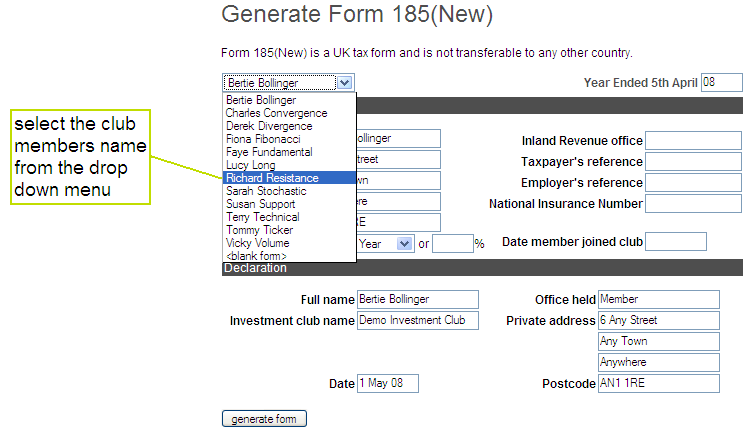 After you have completed the various fields, click on the 'generate form' button to generate a pdf version of Form 185(new). When the Form 185(new) pdf appears, save it to your computer or print it using the normal pdf functionality.